I'm not a huge fan of this blurb, but the meat in it sounds compelling enough that I'll grab it. Plus, I trust Lauren Oliver. Honestly, I don't know if I'd be as gung ho to read it if I hadn't recognized the author. The set-up is intriguing, but there are so many questions about what actually goes on in the book. Does Nick go investigating? Is Dara trying to find her too? Do we get Dara's perspective? Is the accident related to the vanishing? What's with the birthday? Is that important? Obviously, I don't expect all the answers. I just feel like all I know about the plot is that Dara vanishes and Nick tries to find her. Also, why does Nick have to find her? What about the cops? Do they think she's crazy? Without some of this detail, the blurb reads to me like any generic mystery. I want something that stands out. Please note that Vanishing Girls is a novel originally published by HarperCollins, in 2012, by Katia Lief. Some of my readers have expressed confusion, since it's the same title and the same publisher, and so I am spreading the word. 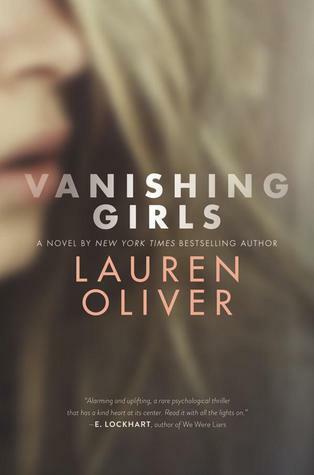 "Vanishing Girls is powerful, provocative, and pulsating with verve; it also marks an evolution of character and circumstance that should serve the series well in future installments. Further, Karin Schaeffer is both complex and compelling, and arguably one of the strongest female figures in contemporary crime fiction—and her absolute strength of will is a testament to the resilience of the human spirit."